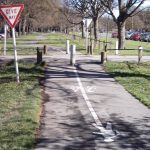 A number of the recent proposed Major Cycleways are using “neighbourhood greenway” treatments, including Rapanui/Shag Rock, Papanui Parallel, and Uni-Cycle. Most people understand the concepts of separated cycleways and shared paths that are being used for many other Major Cycleway sections. 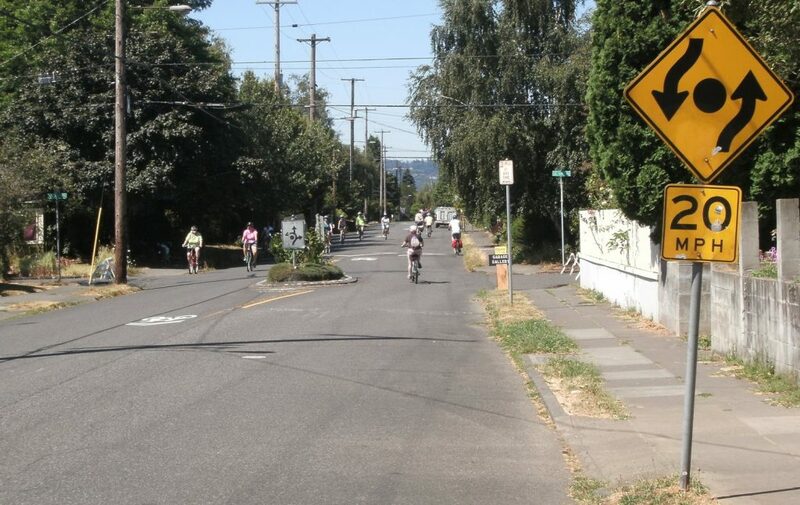 But what exactly is a neighbourhood greenway (NG) and how does it work? We’ve previously introduced you to how they work in Vancouver. 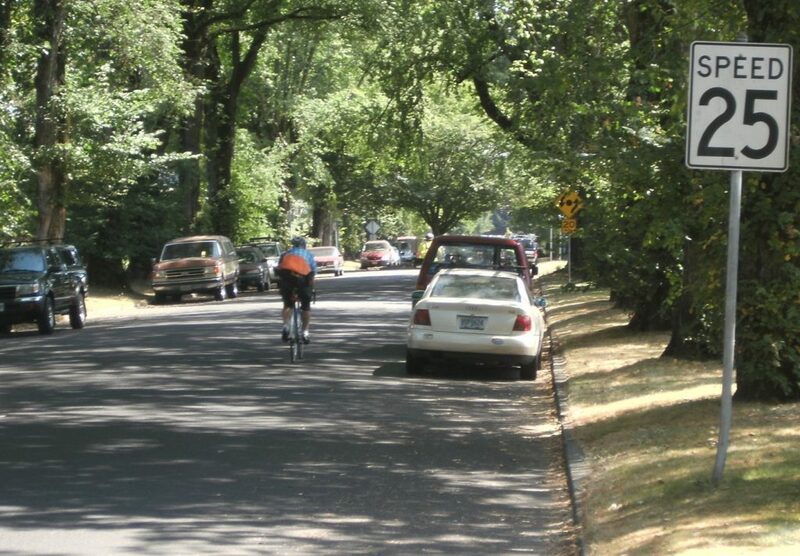 But let’s go back to the originator of the term: Portland, Oregon (you can also read more about NGs in my 2012 conference paper and the new NZTA Cycling Network Guidance has info about NGs too). 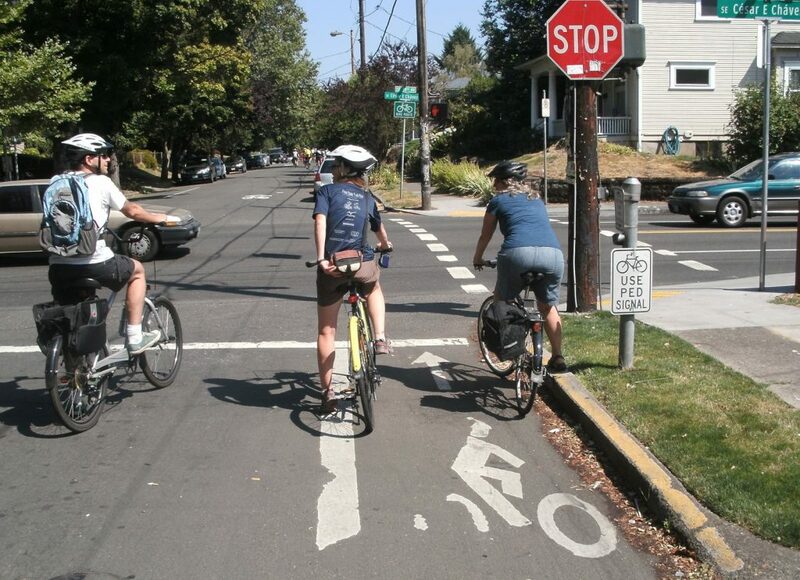 NGs are also known by other names, such as bicycle boulevards, local street bikeways, quiet streets, and so on. In North America they actually originated in Berkeley, California, in the early 1980s. 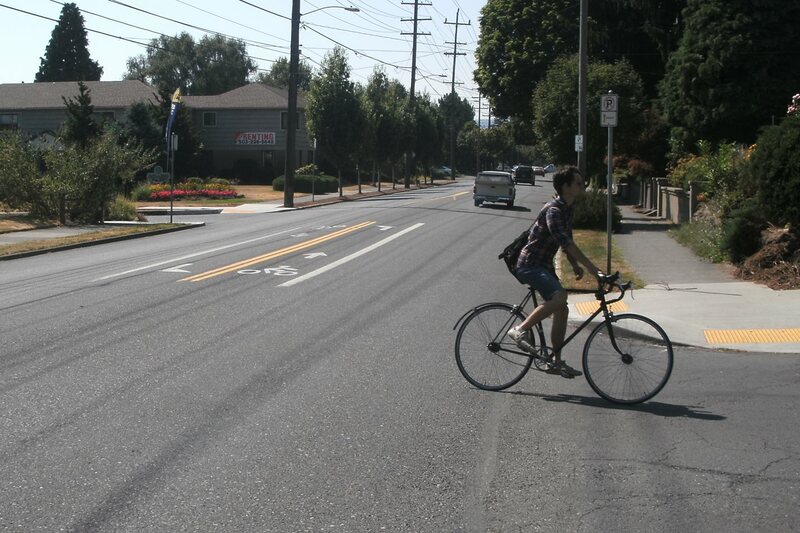 In Europe there is also a similar concept in “bicycle streets” found in the Netherlands and Germany. 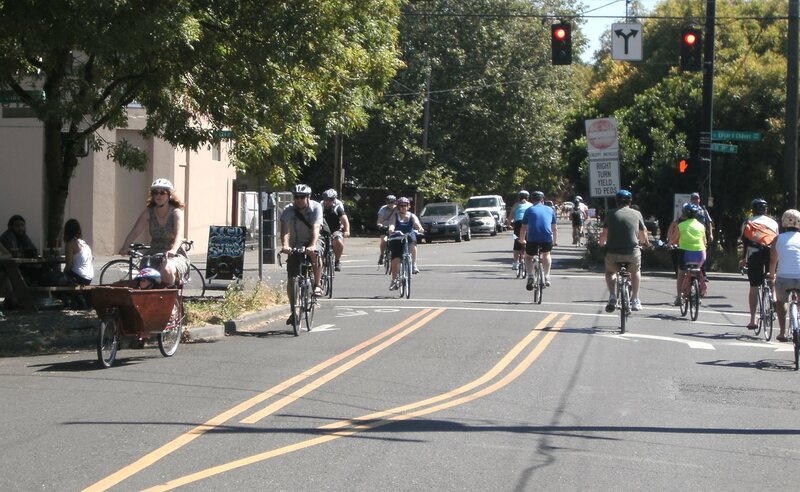 While people often focus on the obvious cycling infrastructure like protected cycleways, in many cases these “bike-friendly streets” are actually the main backbone of a city’s cycling network, particularly away from the busy arterial roads. Introduction of lower posted speed limits, typically 30-40 km/h, and traffic calming treatments, such as raised platforms, narrowings, chicanes and speed humps. Signage to indicate destinations along the route or in the vicinity, often with some “branding” of the NG route. 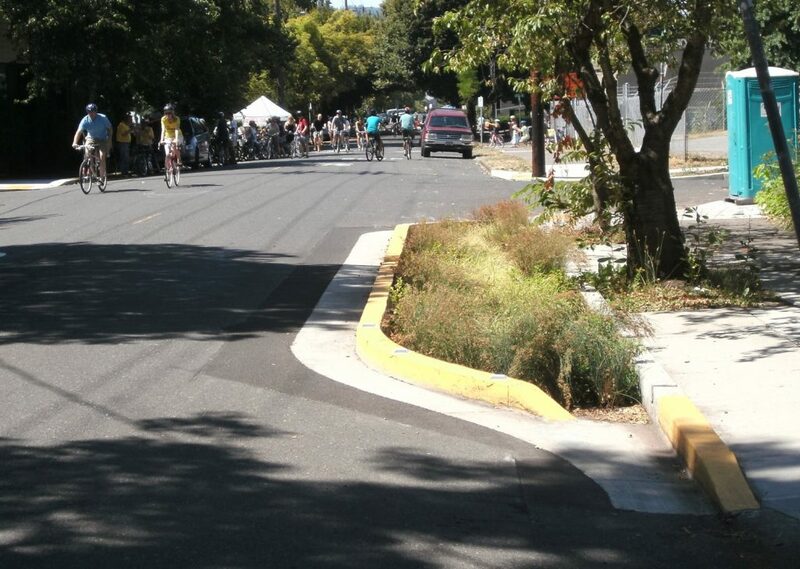 One clever way that Portland has introduced many people to their neighbourhood greenway network is to include them as part of the routes for many of their regular Sunday Parkway ciclovía events, where the streets are closed to motor traffic for the day to let non-motorised users enjoy the space (some of the photos shown here are taken from these events). 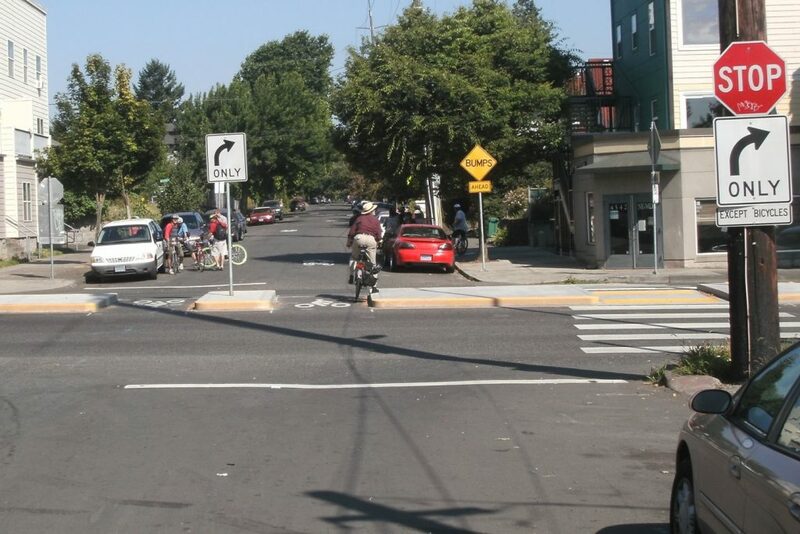 Reduce automobile cut-through – Speed bumps and traffic diverters keep cars trying to avoid main streets from cutting through on neighbourhood streets. 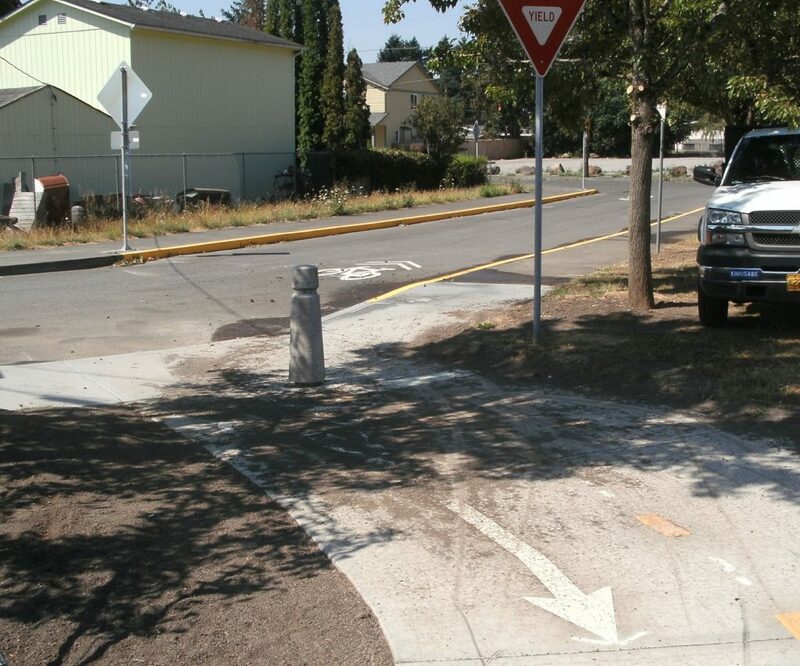 Provide safer bicycling and pedestrian connections – Pavement markings alert people driving to expect people bicycling; improved crossings and curb ramps make pedestrian mobility easier and safer. 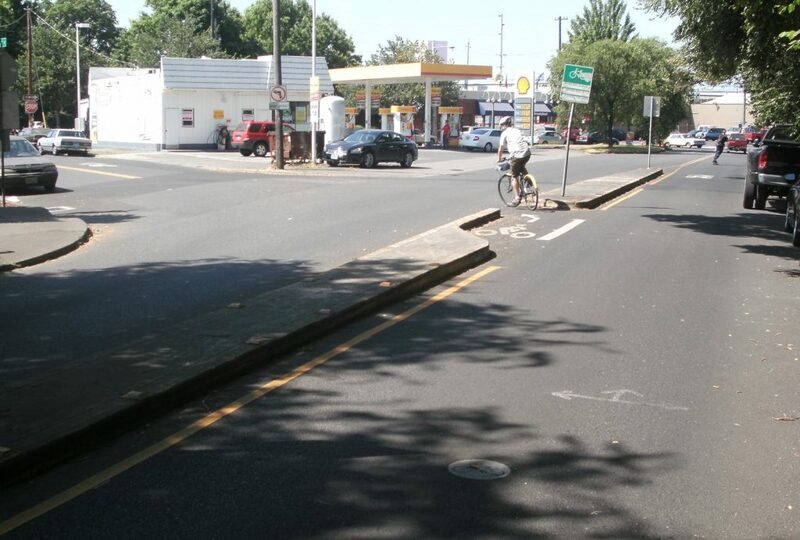 Reduce automobile speeds – Speed bumps help slow automobile traffic on greenways. Help people across our busier streets – Improved crossings at main streets help people walking and bicycling cross more easily. Guide people on the route and help get them where they are going – Markings on the pavement and signage let you know where the Greenway goes and what’s nearby, like parks and business districts. 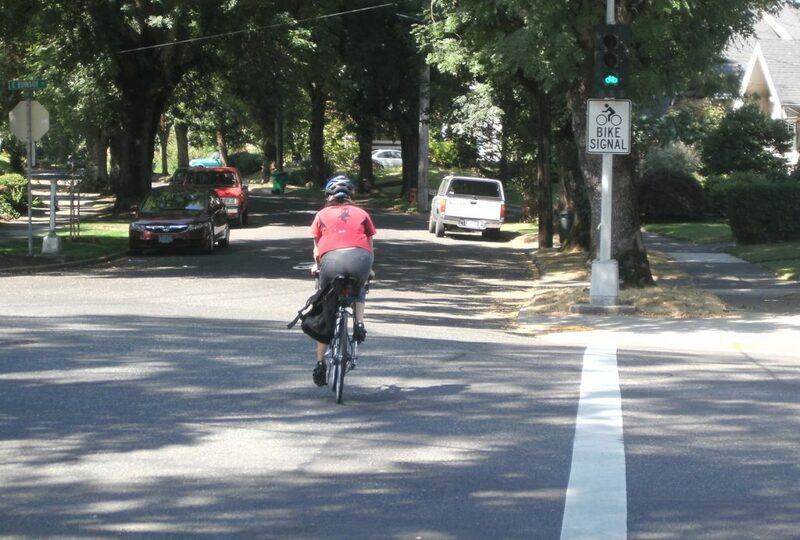 Provide more “eyes on the street” – More people out on the street bicycling and walking leads to safer streets! I’d argue that they also create a much more pleasant environment for residents living along these routes (with a likely improvement in property values). Many of Portland’s NG routes also tend to include kerb extension treatments that allow for raingarden-style stormwater management, thus enhancing the “greenway” component of the name. Grid networks of streets (commonly found in US cities) are the best for introducing NGs alongside busier parallel routes; for this reason, they also suit parts of Christchurch quite well. 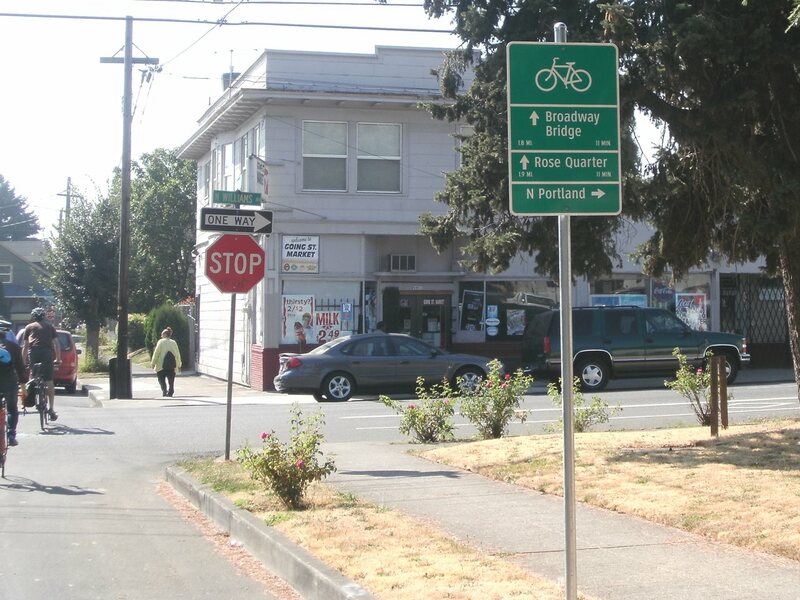 If the route, requires a bit of zig-zagging, then signage, sharrows, and other little features help to guide people the right way. 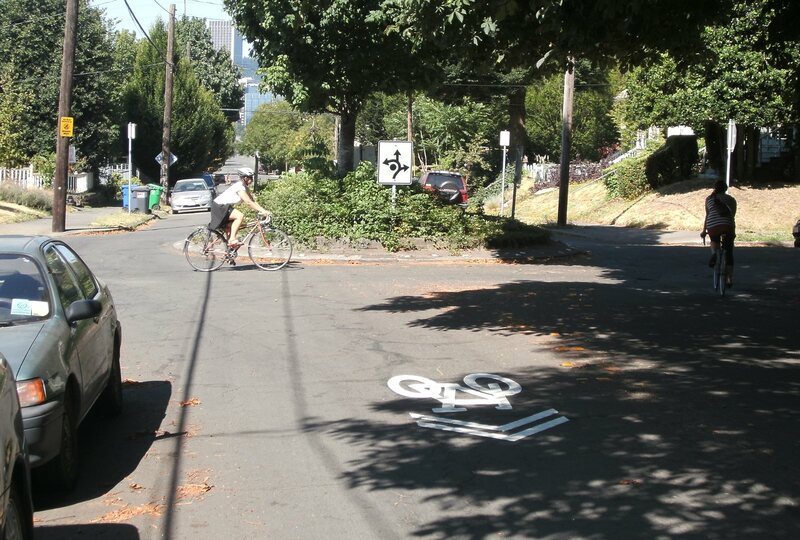 NGs are a very cost-effective way to provide cycling in quieter parts of the street network. The key is to ensure that the traffic volumes are kept low (ideally <1000 vehicles/day, certainly not >2000 veh/day) and traffic speeds low (30-40 km/h max), plus ensure that it is easy to cross over busier roads encountered along the way. What do you think about Portland’s neighbourhood greenways? Can they work here? Do you think some of these concepts could be reapplied to traffic calming and reduction around schools? 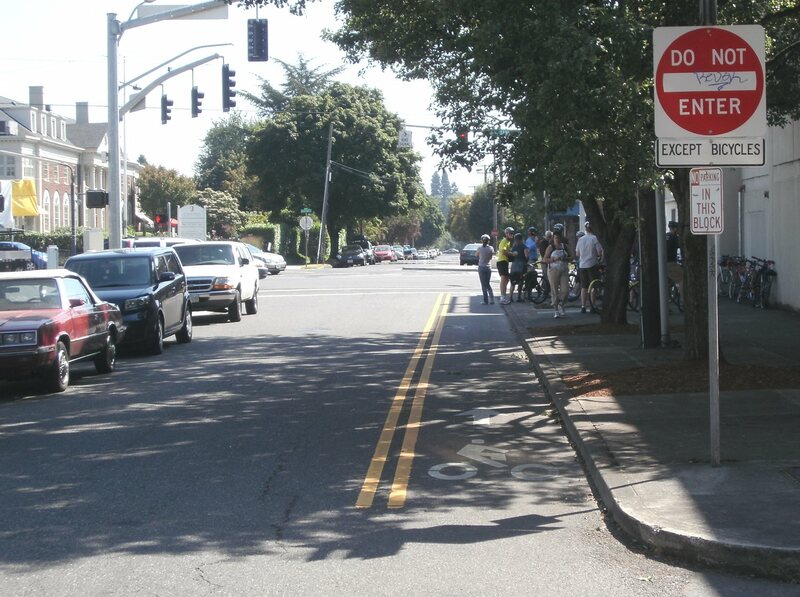 Or do you have best practice examples for school traffic calming? I think the litmus test for the success of our cycleway programme here will be the few metres of ‘neighbourhood greenway’ planned for Trafalgar Street , Edgeware along the Papanui Parallel route. This street is not a ‘quiet neighbourhood street’ it is a narrow curved traffic calmed access way ( read rat run at peak periods) which is lined with parked cars. Converting this into a greenway that will entice the 8 year old to 80 year old bike user to use and feel safe in is a challenge that I think will test the very best of planners and engineers. Fingers crossed !!. Great information from Portland, LennyBoy. 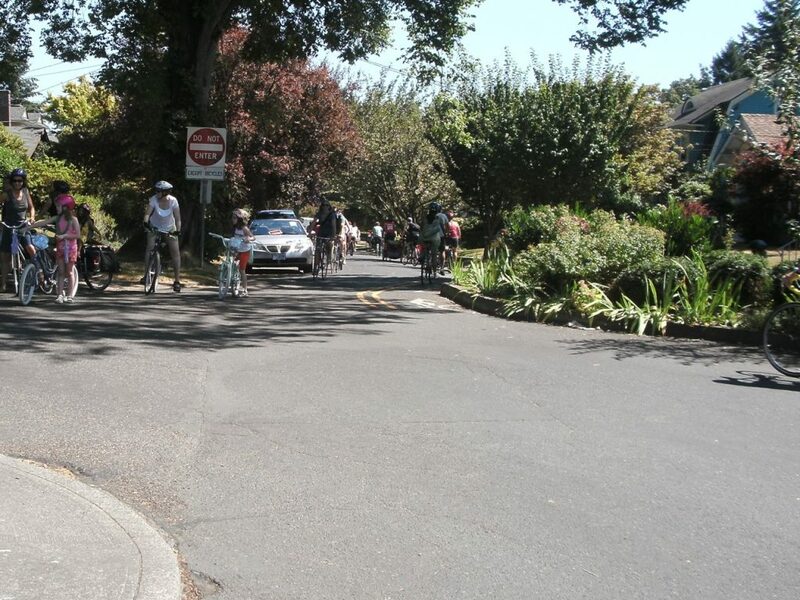 Interesting to consider this, when NZ cyclists are so often being put into shared zones with pedestrians currently (though I found Berlin’s cycling infrastructure, often based on footpath-marked lanes, to be surprisingly successful – http://willandrewsdesign.com/?p=5316 ). Looking at London’s Quietway last month (admittedly at the very busy Waterloo end) I was underwhelmed with the efforts made, and the success- felt almost like a normal city street with lots of traffic including commercial vehicles. So a real effort needs to be made to reduce & calm motor traffic -after, of course, analysing where such streets are in the overall cycling network.